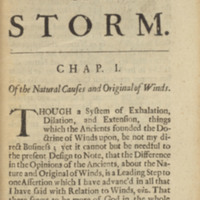 An early example of English journalism, The Storm compiles information about the impact of an immense storm, the equivalent of a Category 2 hurricane that struck England in 1703. 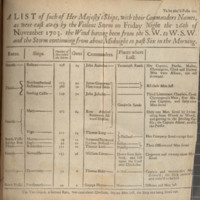 As described by the statistics and eyewitness accounts gathered by Defoe, the storm caused significant damage and loss of life across England including the destruction of forests, ships, and urban infrastructure. The extremity of this act of nature was variously explained as divine punishment for England’s failures in the War of the Spanish Succession or other more generalized sins. Defoe’s writing reveals an interesting intersection between theological beliefs and the growing prominence of scientific investigation. The data contained in this work remains relevant, having been used in modern climate history research. 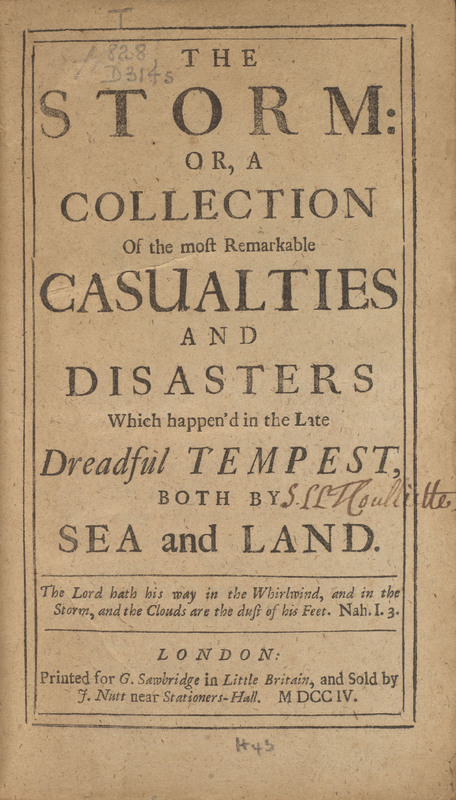 The Storm; or, A Collection of the Most Remarkable Casualties and Disasters which Happen'd in the Late Dreadful Tempest, both by Sea and Land. London: G. Sawbridge, and sold by J. Nutt, 1704.